Earth Day is tomorrow! And though I made this bark last year to celebrate, one of my big blogging goals for this year is to share more easy-peasy crafts. And what better occasion than Earth Day? I LOVE this idea, for so many reasons. First – SUPER easy. While there are many many tutorials for making your own seed bombs (including a paper version of the seed hearts I made for Valentine’s Day a while back), I landed on this one from Mr. Brown Thumb. 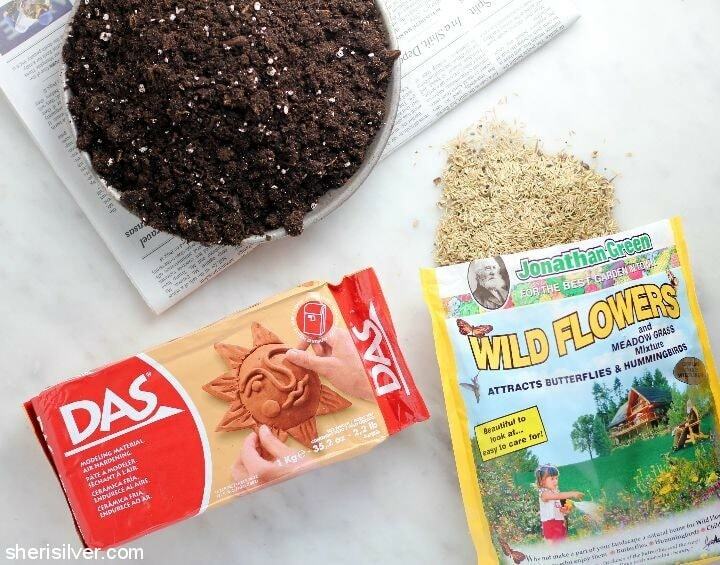 You need – literally – three things: soil (any kind will do), seeds (I used a wildflower mix from a local nursery) and air-drying clay, which I found at the craft store. 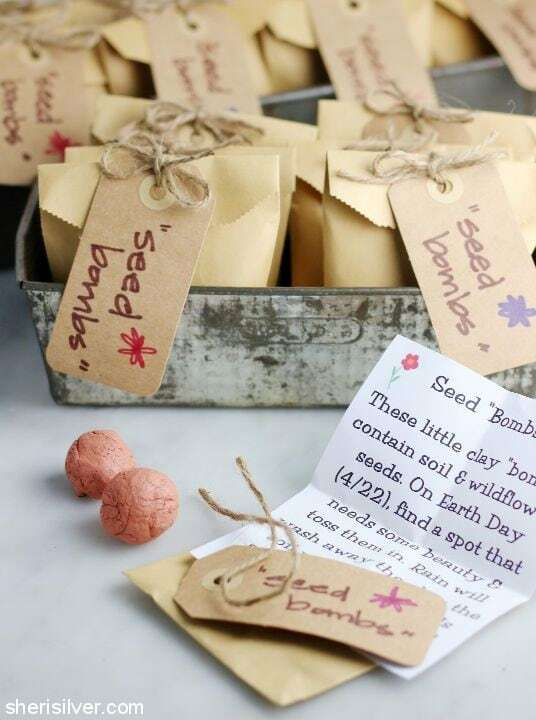 When the bombs get wet the clay gradually washes away, and the damp soil that remains helps to keep the seeds in place and germinate. 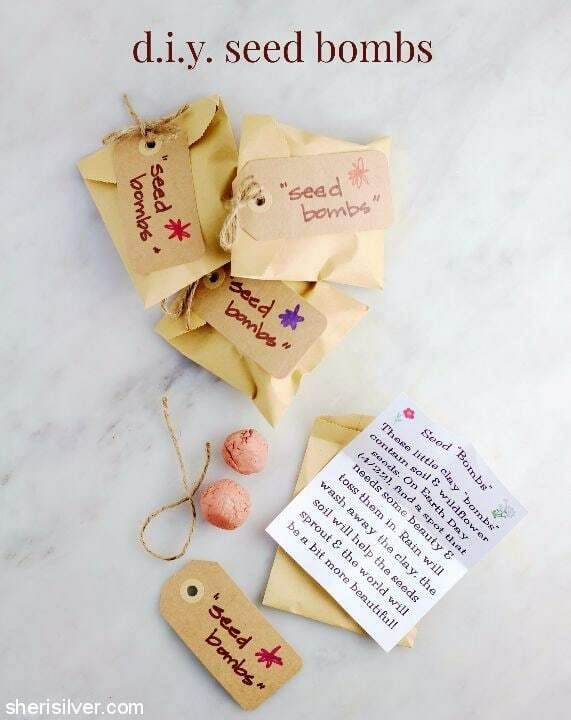 I’m also smitten with this idea because it avoids the whole allergies-in-the-classroom challenge of bringing in a treat, and allows kids to – with their own hands – beautify their world. I love the notion that in this age of instant gratification time and patience are essential ingredients here, and kids may never see the results of their efforts. They simply need to be satisfied with knowing that they’ve done their part to make the earth a little more green. 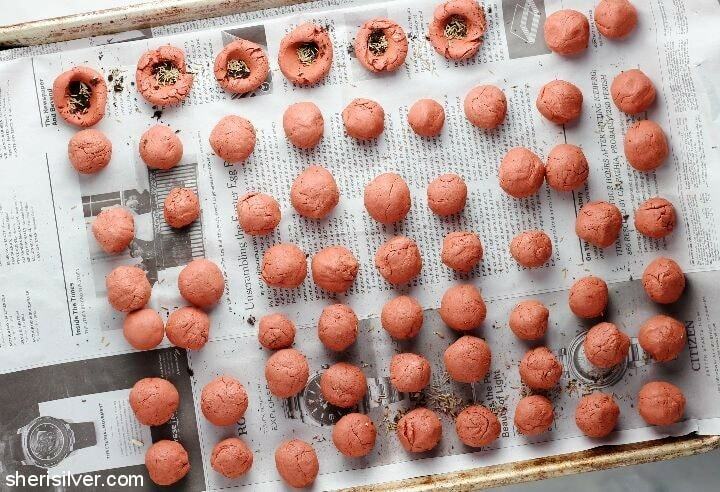 I bought a 2-pound block of clay, which made enough balls for everyone in the class to get 2 or 3 “bombs”. I tucked them into envelopes, along with instructions (print yours out here! ), and tied them up with tags and twine. Cover your worksurface to protect it from dirt and spills. Line a baking sheet with newspaper. 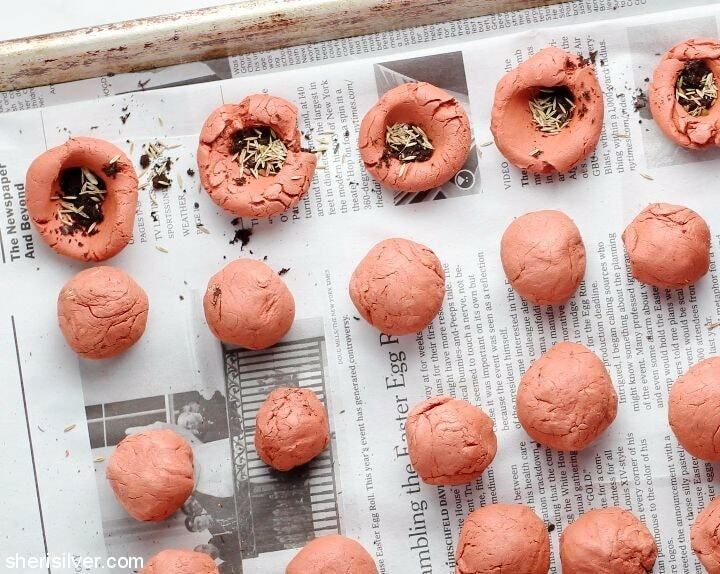 Break off a bit of clay and roll into a ball. 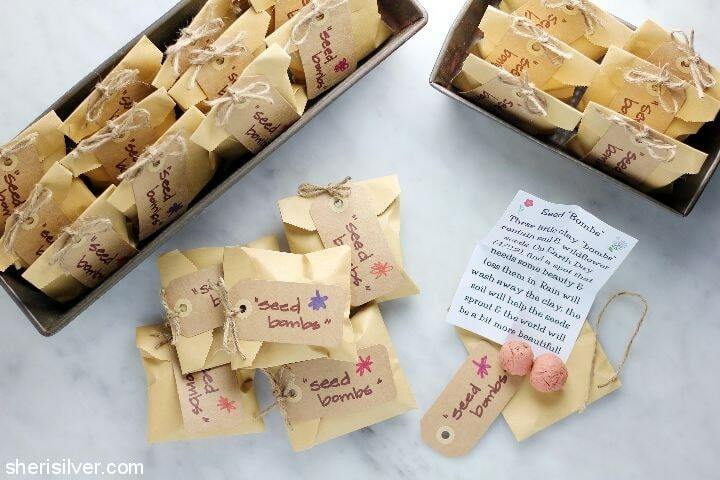 Use your thumb to create an indent, and insert a pinch of soil, followed by a pinch of seeds. Seal the indent and re-roll into a ball. Repeat with remaining clay, soil and seeds. Let clay dry for a few days, turning the balls if you like (next time I might set the balls on a wire rack so that air circulates on all sides). 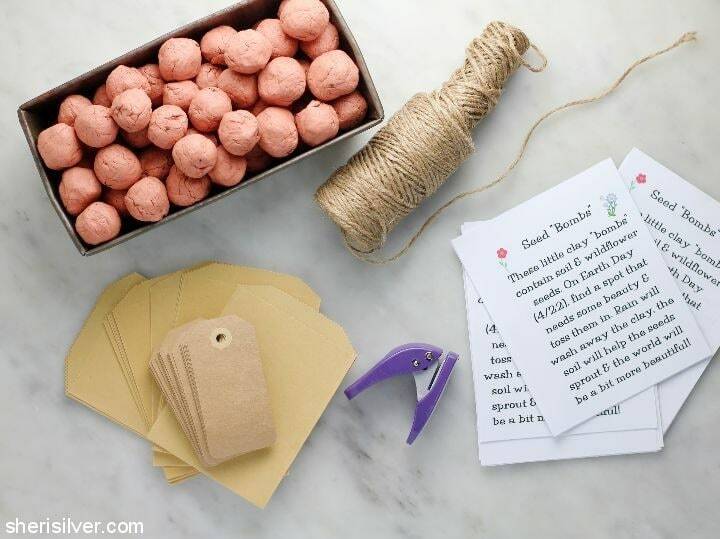 Once dried, place a few balls in each envelope, along with instructions, and tie up with a tag and some twine. Thank you (and so easy!)!!! Can i ask where you found the small paper envelopes?